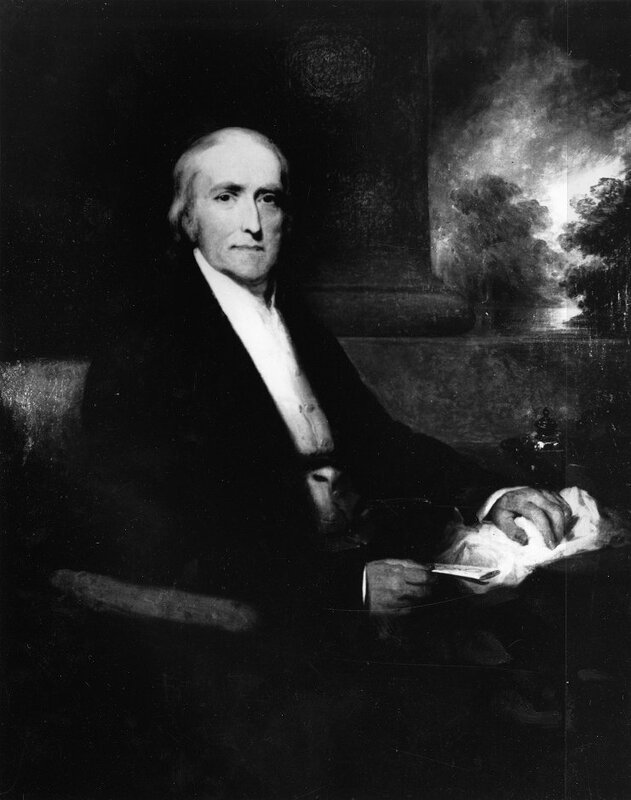 Philip Syng Physick was born in Philadelphia in 1768, the son of Edmund Physick and his wife Abigail Syng. Edmund Physick, a prosperous businessman, was keeper of the Great Seal and receiver general of Pennsylvania and then served as an agent for the Penn family during the Revolutionary War, managing their estates and interests in the colonies. Abigail Syng’s father was renowned silversmith, Philip Syng, Jr.
After his early classical education at the Friends’ Public School, under its master, historian Robert Proud, Physick attended the College of the University of the State of Pennsylvania, graduating in 1785. He then briefly considered becoming a craftsman like his grandfather, but instead studied medicine. He spent three years as an apprentice to Adam Kuhn, professor of materia medica at Penn’s medical school, and took some courses in the medical school but did not enroll as a degree student. In 1788 Physick traveled to England where he continued his medical studies under the famous surgeon John Hunter, who introduced Physick to the practice of teaching anatomy not from books, but from cadavers. Physick, exhibiting unusual skill in the dissecting room, became one of Hunter’s favorite students. Because of Hunter, Physick was in 1790 appointed house surgeon to St. George’s Hospital, before he went on to study at the University of Edinburgh where he earned his medical degree in 1792. Returning to Philadelphia, Physick set up a practice with the help of his friend Benjamin Rush. When the yellow fever epidemic hit the city in 1793, Physick was among the physicians working with fever victims and himself became ill with the fever. He credited his survival to Rush’s treatment of bleeding and purging; Rush in turn began referring his surgical cases to Physick. Physick’s private practice and his appointments grew rapidly. He served as surgeon to Pennsylvania Hospital from 1794 to 1816. He began his affiliation with the Philadelphia Dispensary in 1794 as well, and also served as surgeon at the Philadelphia Almshouse (1801 to 1816) and as consulting surgeon to the Pennsylvania Institution for the Blind in 1821. A popular and successful teacher, Physick was elected the first professor of surgery in the University of Pennsylvania medical school in 1805. In 1819 he gave up this chair to become the University’s chair of anatomy, holding this position until he retired in 1831 due to failing health. During this period he also offered lectures on surgery at Pennsylvania Hospital. Physick focused on developing solutions through practical experience, and in the process gained great reknown as the “Father of American Surgery”. His contributions include increasing the length of the splint for thigh fractures, the use of a seton to treat ununited fractures, the invention of the earliest stomach pump (Alexander Monro of Edinburgh developed a similar apparatus at the same time), the introduction of absorbent catgut sutures to replace silk and flax sutures then used, and the development of instruments for removing tonsils. He was also the first in the United States to perform a successful lithotomy operation (for which he developed a special forceps) and to surgically repair an arteriovenous aneurism. When Chief Justice John Marshall, at age 76, needed surgery to remove about a thousand small bladder stones, it was Physick, then in his early sixties, who was called upon to perform the operation. A decisive and practical surgeon, he was more interested in practicing medicine than in publishing his findings. Instead Physick’s case histories and lectures provided the core of his nephew John Syng Dorsey’s Elements of Surgery (published in 1813) and of William Gibson‘s The Institutes and Practice of Surgery (published in 1824). Physick was a leader in Philadelphia medical societies, acting as president of the Philadelphia Medical Society (1824-1837) and as the first president of the Academy of Medicine (founded 1797). He was elected a member of the American Philosophical Society in 1802, the Royal Academy of Medicine of France in 1825, and an honorary fellow of the Royal Medical and Chirurgical Society of London in 1836. Physick married Elizabeth Emlen, the daughter of a Samuel Emlen, a prominent and wealthy Quaker preacher, in 1800. They had seven children, four of whom survived to adulthood, but their unhappy marriage led to their separation in 1815. In that same year Physick acquired the property at 321 South Fourth Street; after making substantial modifications to the house on that site built by Henry Hill in 1786, Physick lived here until his death in 1837. The Physick House is now a museum and the only free-standing Federal townhouse remaining in Philadelphia’s Society Hill.